What is the Manga CPO? Aiming to connect to the world with content creation. Many mangaka, manga author, manga researcher, illustrator, film scenario writer and such are participating in event and international exchange held with Manga CPO in order to identify and nurture talent for the next generation. What is the MCPO Award? We have excellent contents such as manga and comics illustrations but we are also working toward a variety of media like animations and games in order to grow in conjunction called « Content Seed ». MCPO AWARD is set to discover the next generation of creators but also planning the birth of a new content seed. Thanks to this contest, we are expecting the birth of a new manga contest business that goes beyond national borders. Dear creators, we look forward to your application. Finally, we would like to thanks MediBang and everyone for cooperating with us and allowing such a collaboration to be made. We would like to thank you all so much. We will introduce a special jury for the MCPO AWARD. 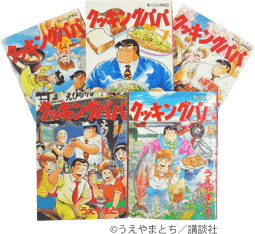 In 2015, after being serialized for more than 30years, « Cooking Papa » won the 39th Kodansha Manga Award, Special Award. « Cooking Papa » is going to have its 139 volume published on November 22th, 2016, issued just after KochiKame and Golgo 13. Moreover, « Cooking Papa » detains the record as the world’s longest cooking manga. A weekly published recipe which uses a large piece of seaweed wrapped in rice and side dishes « Do not pinch the rice ball » set off a wave in Japan. He debuted on 1993 with works such as « Municipal Forces DAITENZIN » and « Death Less ». With a publication of 27 volumes in total and 3,5 million copies of « Excel Saga » sold, and a collaboration work with Shirô Masamune in order to create the blockbuster TV anime « Pandora in the Crimson Shell: Ghost Urn ». ※Original : Shirô Manamune, 9 volumes previously published (Kadokawa Comics Ace), TV anime aired 2016. Powerful debut with « Night Keeper » in 2001 (Square Enix published). Major work « Heaven’s Lost Property ». 20 volumes of this manga have been released with about 3 million copies sold. « Heaven’s Lost Property » had its first anime adaptation aired on 2009, followed by the 2nd season on 2010. The movie was aired on 2011 and the second movie on 2014. 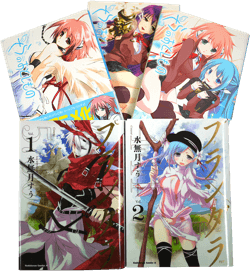 « Plunderer Hina » (5 volumes previously published) is currently published in the Shônen Ace. In 1980, he participated in an original project by « Studio Nue ». After that, he worked on a lot of character designs for popular anime titles such as « The Super Dimension Fortress Macross », « Megazone 23 », « Gunbuster », « Mobile Suit Gundam 0080: War in the Pocket », etc. Leading him to set foot into the anime industry, thus allowing him to bring into the spotlight a new and fresh sophisticated kind of characters and received backing. He is now active in the field of illustrations, comics, character designs for games and most recently worked for the anime « TYTANIA » and « Kabaneri of the Iron Fortress » as a character designer. Other famous illustrators will also be part of the jury. 300,000yen cash prize + Your work will be viewed by Manga CPO, MediBang, manga website from all over the world which would include about 35 million people but also published in magazine or book by Sougeisha. 150,000yen Cash prize + Your work will be viewed by Manga CPO, MediBang, manga website from all over the world which would include about 35 million people but also published in magazine or book by Sougeisha. 1Draw a manga or illustration! ※This applies only to English, Korean, Chinese (Simplified and traditional) . From your 'Submissions' list click 'Details', add the 「MCPOAwardMangaSection」 tag to your submission in it's settings and save it. Under 'Illustrations' choose the type of file (JPG or PGN) you'd like to submit, and upload it. Enter a 'Illustration title' and a 'Description', add the tag「MCPOAwardIllustrationSection」and click on submit. Cash prizes can be paid to the PayPal accounts or bank accounts (bank transfers will have surcharges) registered to entrants accounts. Japanese, English, Korean, Chinese (Simplified) and Chinese (Traditional) can be submitted. Anyone can enter, whether they're a pro or amateur. Entering as a team is also possible. Entrants must own all the rights of his work and publish it as free to read. Moreover it has to be a non-commercial publication. Plagiarism and entering another contest with this work other than contest with MediBang is prohibited. Grand prix : 300,000yen cash prize + Your work will be viewed by Manga CPO, MediBang, manga website from all over the world which would include about 35 million people but also published in magazine or book by Sougeisha. Grand prix : 150,000yen Cash prize + Your work will be viewed by Manga CPO, MediBang, manga website from all over the world which would include about 35 million people but also published in magazine or book by Sougeisha. Winners will be invited to Fukuoka for the Award event and exhibition. Entries in English, Korean, Chinese (simplified and traditional) will be translated into Japanese and submitted to the editors. We strongly recommend that you read all the terms and conditions prior to entry. Sponsors: KBC Co. Ltd., Wacom Co. Ltd., SKO Co. Ltd., （株）クレオミク, Miyako Kampo, and Enomiya Consulting Pharmacy Inc.